It’s that time of the year again; the time to reflect on the year gone by, and welcome the New Year with renewed enthusiasm. This is also the time when we make resolutions and set goals for the New Year. I have had a strange relationship with resolutions. I used to love making them, but I barely ever managed to stick to them post January. And then there was another phase in my relationship with resolutions – avoidance. I decided to completely ignore them. I mean, what was the point? It made no sense to continue what was essentially a meaningless ritual. However, that had a downside too. It made me feel directionless in a very strange sort of way. So since last year, I set selective, reasonable goals, in certain areas of my life, where setting goals makes me feel accomplished, without feeling overwhelmed. Reading is one such area where settings goals works for me. However, after several years of trial and error, I have realized that there are some things one must keep in mind while setting reading goals. 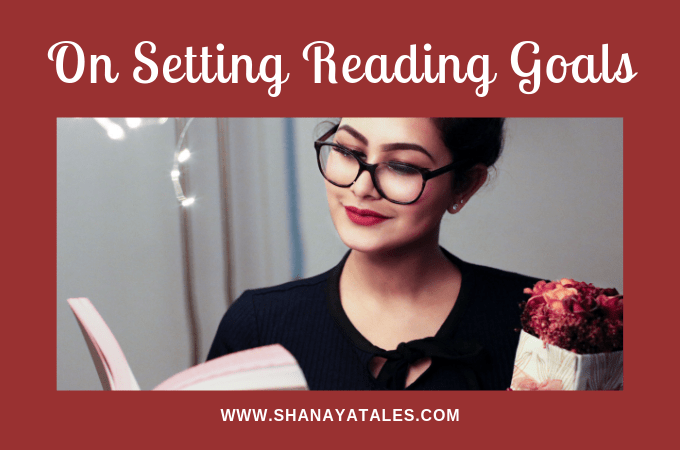 Today, I am sharing some of the things that I consider while deciding on my reading goals, in hopes that these will help you tailor-make a reading plan/goal for yourself. This is the number one thing that you must keep in mind while setting your reading goals. Do not set goals that only ‘look good’, but ensure that they ‘feel right’. If you are someone who can read 100 books a year, that’s great – more power to you! But do not set that as a goal only because you want to surpass someone else’s goal. That is just pointless, and serves no purpose. For myself, I have set 30 books as my number goal for 2016. I know it might appear low to a lot of you, but this is what is realistic for me. Mostly because, while I love to read, I have a life outside of being a reader; I have a child to raise, a husband to hang out with, and a blog to write on. This is something that works very well for me. I am not someone who will make a list of specific books that I want to read, even though I generally have a good idea of what I will be reading next. The only reason why I do not specify the book is because it activates the rebel in me, and then the last thing I want to do is read that book. So, I counter this with setting a specific broad goal, but with some flexibility. For instance, if the specific broad goal is to read a classic, I still have the freedom of picking any classic. This way, I read very much in line with my overall goals, and yet have the flexibility to pick and choose what I read. Read what you truly want to read & have fun! This is very important. Always read only what you truly want to read, or what you are in the mood for. Do not feel that you have to read certain books at certain times. I recently wrote a post about how external factors can influence one’s overall enjoyment of a book, and how that must be considered when picking your next read. But that is just one aspect of it. Some people I know, feel the pressure to read ‘important books’ (whatever that is supposed to mean! ), or even keep reading when they do not feel like it, just to meet their Goodreads goal. Reading should be fun. Don’t let anything/anyone make you forget that. This brings me to the final thing I want to mention. In the spirit of keeping reading fun, this year, I have decided to create a visual reminder/tracker of my reading goals – a Bookish Bingo, which will be up on the blog in a few days. 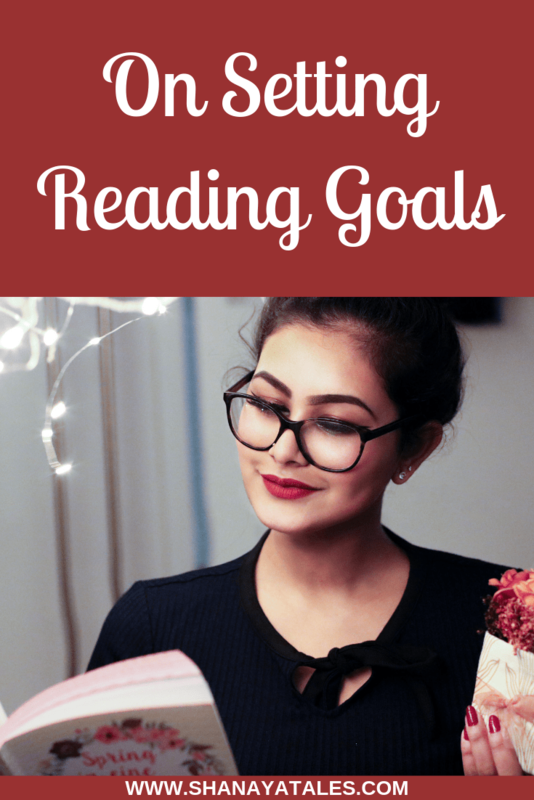 I hope this post will help some of you in setting or tweaking your reading goals. I would love to hear from you guys. Do you guys set reading goals? More specifically, do you set number goals? What is your top reading goal for the year? Today’s Post is featured on Mary Hill’s Literacy Musing Mondays. This is a link-up that I came across a few weeks back through Corinne Rodrigues @ Everyday Gyaan, and I have found them to be an incredibly encouraging and friendly community. 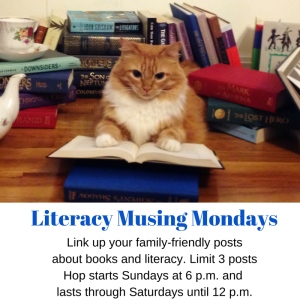 So be sure to visit them and link up your family-friendly posts about books, literacy and learning, every Monday! Yeah 30 is such a reasonable number. I do envy those who can read 100-150 books a year, but envy does not mean I want to get into a race with them. I’d rather be comfortable. Oh and you know that I SO agree with that point about reading what you want to read as opposed to what you feel you /have/ to. Right, it always amazes me when people write about how they read an “important”/ “milestone” book and also mention that they hated the whole experience, but will read the sequel, just to keep up with everyone. I wonder what their motivations are! And, oh yes! I envy the ones in the 100/150 book club too. But I know that it is not something that I can do, at-least in the current phase of my life, and I am okay with that. Reading is sometimes a distraction, sometimes an escape, but I will never make it a race! Good luck with your reading goals for the new year! I am always a bit superstitious about announcing my goals/resolutions, but I do have something like that in my mind as far as reading/studying is concerned. Let’s hope I can work sincerely toward that in the coming year. I know from experience that announcing goals works for me, but to each his own! I have reading goals for next year. Goodreads has always been on my list and I’ve changed the limit each year depending on what I am capable of. For this year it was 25 books and I’ve managed 29 so far and aim to finish another before the year ends. For next year, I thought I’d try with 35. I know what you mean by having a life outside of reading too. Balance is the key to all goals. Exactly. Moderation and balance is important. However, the definition of those things might vary from person to person. Very precise and to the point post on goals. I relate to it on so many levels. I do not have reading goals per say but i definitely set goals in all important areas of my life. I do like to set them category wise though, that ways it keeps things balanced. Yeah, category wise makes sense. It helps to focus better. I cant set reading goals for myself. Just cant. I thought I would try it for 2016.. but couldn’t! “Reading goal” is a new one for me 😀 but interesting. I used to be a voracious reader, before my kids were born – even managed 200-250 books a year. I read next to nothing when my kids were born till the second one started going to school. I have slowed down a lot nowadays; time seems to have shrunk. I have a “Writing goal” now along with “Publishing goal”. I realise that the first slows down when second doesn’t speed up. 2014 was awesome with 4 books published. Lovely tips! Would help me as well… though 30 was the target for the #HTBrunchBookChallenge of 2015 I stopped counting and even posting mid way (yep, laziness). Whatever this Bookish Bingo is, sounds like a good reminder. Reading Goals are wonderful tips to plan in 2016. Thanks for the post. 2013 was the first and last time I set a reading goal. [Hangs head in shame] Long term goals just don’t seem to work for me currently. So I’ve made a practice of setting only daily goals. I probably read at least 100 books per year and I have learned to read what I want to read and no longer pick up books that are currently popular or of a certain genre. Another thing I’ve gotten better at is putting a book aside if it doesn’t capture me after the first few chapters. I used to finish everything I started but no longer. I read much less when my children were little like yours. Now we sometimes all sit together in a room and quietly read. It’s great. Oh I have a problem with that. I always try and finish the book that I start. However, I am working on changing this habit, as life is too short for reading things we don’t enjoy, and there are just too many good books waiting to be read! Working now on setting my reading goals for 2016. I’ve tried it several different ways (a list of specific titles for the whole year, by genre each month, etc.) Just not sure how I want to tackle it for this next year, but already have a Pinterest board full of books I want to read! A Pintrest board for TBR Books sounds interesting! I will be having a post up, outlining my specific reading goals, in the form of a bookish bingo. I feel that might give you some ideas to base your goals on. Do let me know what you think. ?? Well I am in the 120+ reading goal and read many more than I had thought. Many I have not even added to Goodreads. But what ever works….I have no time for TV, watch few movies and carry a book everywhere – even while visiting friends. But I like to be flexible about it….choose my book and have a good global mix of books. I have been neglecting many good books but not anymore.. I hope you have a great new year. Will check out the link up and bingo. Shantala you are speaking my mind. I dont like to rush through books. I too have set a reasonable target of 2 books a month. I am so curious about bookish bingo. What it is? The last point resonated most, Shanaya. It’s important to read what you truly want. That lets us enjoy the reading process. Everything else follows after that. Hi Shanaya. Such a wonderful post. I found it really inspiring and insightful. Especially because I have set plenty haughty and fancy looking goals, and only now I am realizing how important it is to consult with our deeper selves and find out how we feel about it. I think that transition from focusing on how things look to how we feel about them takes time. And it’s more of a personal growth/journey which may take days or years, for us to reach there. And now that I have I can find myself doing things that matter more and I find sensible and I get most out of then doing rather than doing plenty of diverse things. So in the reading part of my life, I am going to try your advice. I am especially fascinated by the ‘setting specific yet flexible goal’ tip. I am going to use this creatively in all that I do, be it reading or writing or blogging. Will keep you updated on my experiences with that one 😀 I love it! I can already sense the awesome potential of that tip! Awesome article Shatala. You have really spoken my mind. Specially the last point. Just like you cannot eat every item in a buffet similarly you cannot read all books that comes your way. Maybe just tasting a bit of it can crave you for more. Yes I too plan on improving the number of books I read in 2016 and have set myself a doable target of just a book a month. I know this sounds ridiculously low for an avowed book lover but honestly, the only things I can read carefully these days are prescriptions and instructions and ingredients on labels! You are absolutely right we should read; what we want to read and when we want to read. Specially while reviewing a book else justice can’t be done for both the readers and authors. Very true, Ruchi. Timing is very important. Bad timing will not only ruin our experience, but will also be unfair on the author, if a review is posted. Specific goals..numbers..don’t work for me too. I don’t know what it is…maybe the rebel in me! 😉 But last year I chose a word for the entire year to help me achieve my goals and it worked. Trying it this time too! And here’s wishing you a very Happy new year!! Great tips. I am so going to follow tip no. 3. More often than not, I just drag and push myself through a painfully boring novel just to check it off my list and this really slows and slackens the reading spree. So, this year, I want to stop reading a book that does not appeal to me. Period. And go for books that I would truly enjoy! Very true, Shilpa. Pushing through books that I am not interested in, is the #1 reason for my reading slumps. Hmm Interesting post. I have a huge pile, that I had bought in 2015, waiting to be read, so hopefully I will be able to finish those. But then there are review copies and other interesting titles that I discover and am tempted to read those as well. So, setting a goal of 30 books. Very nice post. I especially liked the 3rd point- read what you are truly interested in reading. About setting realistic goal for reading, I truly agree. I was so excited to set my reading goals, that initially I set 100 books as my reading goal for this year! And then when I calculated, it came to 8 books a month. It is not impossible, but I do have other goals too, I realised. So I have set 24 books as my reading goal fr this year. Very less but realistic. I never had to set reading goals before because I always read. I set it this year because I havent read much last year. Setting flexible goals, yes. Because you never know what work may come up unexpectedly. This shouldn’t deter your goals. Unexpected things can delay your goals which may end up making you disappointed. Here’s wishing you good luck for your reading goals. Thank you so much for your wishes, Seeya. And yes, you are right. We need to account for our other goals, and ensure a good balance in our life. If I was able to do this, and read 100 books, I would have certainly set that as a goal. But as of now, that is not the case. I like buying books on a whim, I like discovering writers and be amazed by their writing. Although I do read reviews, but mostly it’s the fun of finding an amazing book that takes me to a bookstore. This year I need to be more planned.